Vila Nova de Cerveira may be small but it made a lasting impression on me. This northern Portuguese village on the bank of the River Minho, has bags of natural beauty, historical architecture and more than its fair share of art. It’s also named after a legendary stag. In no particular order, here are 10 of the many things to do in Vila Nova de Cerveira. 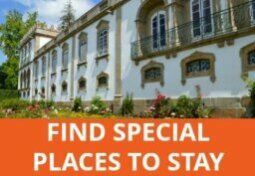 Note: If you want to use this charming place as a base for exploring the Minho and neighbouring Galicia, see my accommodation picks below. I’m guessing that the colourful lampshades and umbrellas dangling over the cobbled streets were part of the biennial arts festival. As we roamed the historical centre, we encountered some installations that were definitely temporary features. Some wonderful, others downright weird. Much of the festival art is concentrated in the exhibition hall, although there were several exhibitions in the castle, including a cage of body parts. The sculptures dotted around the town and riverside park are more permanent so even if you miss the arts festival, you won’t go artless. It’s on again overy other summer, so if you’re interested, see if you can make sense of the arts biennial website. 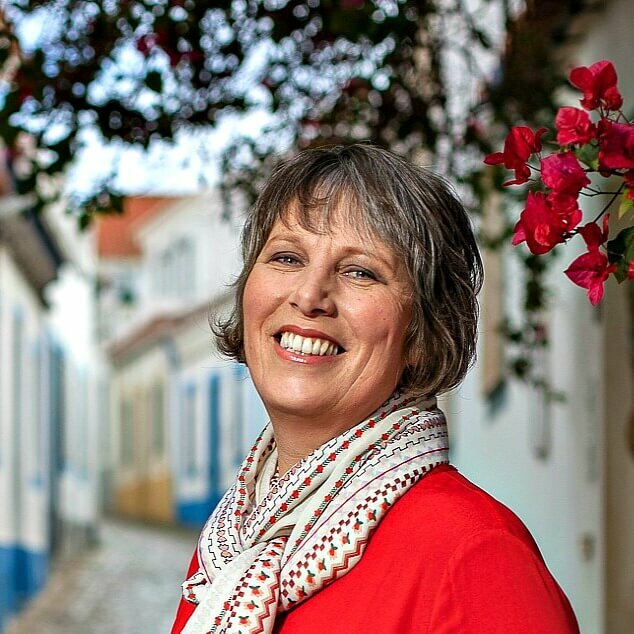 For something more traditional, visit Casa do Artesão. Not far from the tourist information centre, you’ll find an early 20th century glass and metal structure that used to be the town market. 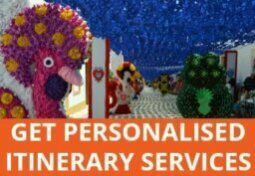 These days, it’s devoted to showcasing and selling quality local handicrafts and produce. King Dinis ordered Vila Nova de Cerveira’s castle to be built in 1321 to defend his recently created township. The layers of the doorway hint at various alterations over the centuries and architectural elements from various eras are ensconced within the walls including the 16th century town hall and the parish church, reconstructed in 1877. The 18th century Solar dos Castros is a beautiful building that is now home to a modern, well-equipped library. We were drawn in by the gardens at the back of the building and left feeling as impressed with the facilities as we were with the flowers. 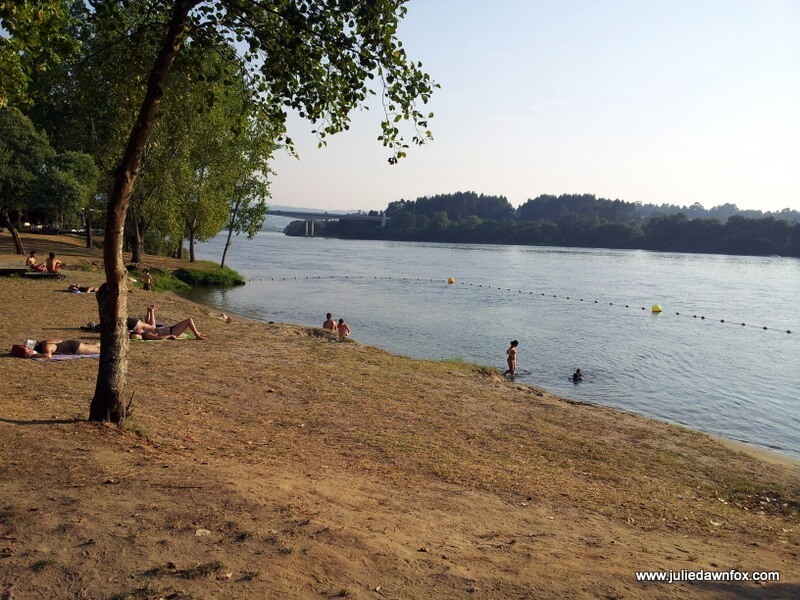 One of the loveliest aspects of Vila Nova de Cerveira is its riverside Castelinho park. Not only is it studded with sculptures and benches, it also hosts a water park which, if the jets of water spurting out from various stations at intervals are anything to go by, looks like the perfect place to spend a hot summer’s afternoon. There are various other play areas and a few cafés in the park including one on a rather military-looking ferry boat. 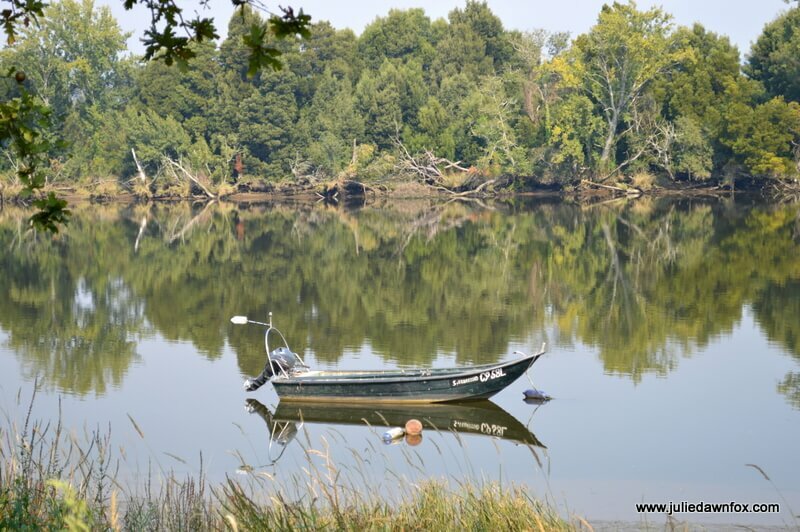 We simply explored the river bank and found a rocky islet and a shaded space to relax and listen to the birds and the soft lapping of the water against the shore. It’s possible to hire bikes and kayaks from the hut in the park and do your own thing. Or, if you don’t fancy doing any exercise at all, Port Nautic operate 3-hour boat trips on the River Minho leaving at 10 am and 3 pm. Mike and I opted for a kayaking trip down the River Coura to Caminha, starting at the Roman bridge in Vilar dos Mouros. The dragonfly that landed on my hand as we paddled down the tree-lined river was an added bonus. I was quite glad to be in a two-person kayak so we could take it in turns to row. Once we merged with the wider Minho River just before reaching Caminha, the water got choppier and both of us needed to work quite hard to make any progress. For those of you who prefer to stay on dry land, the ecovia cycle/walking path runs parallel to the river and through the park along a purpose built red track, pavements and dirt tracks. The first stage covers 6 km, connecting the village of Gondarém with the Praia da Lenta river beach. Work on the second phase began last year and is due to be finished in 2015, linking V.N. de Cerveira with Valença to the east. Look out for the Ecovia signs leading off the main road at various points to help you find it. If the water park and Parque do Castelinho don’t appeal or you just fancy a slight change of scenery, you can walk, cycle or drive east to Praia da Lenta. There’s plenty of parking and a café as well as a picnic area. The ‘beach’ is actually a grassy bank, which by August was pretty bare and dusty, although there is a tiny patch of sand. If you feel the need for more art and sculptures, head to the hills to find the Convento San Payo Museum (check the website for opening times as they vary throughout the year). The main house is packed with sculptures and paintings while the gardens have a generous sprinkling of sculpted forms. If you have time, you could take a walk in the woods next to the convent or have a picnic here. 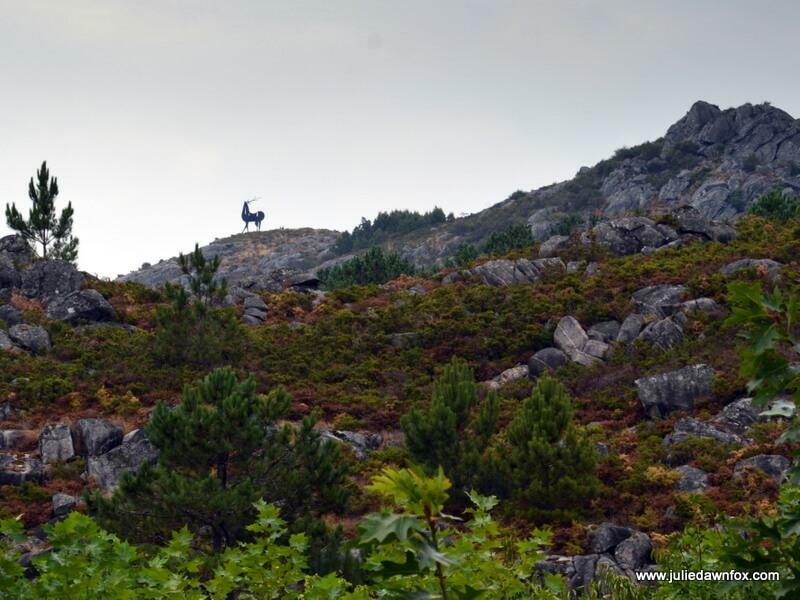 While up the mountain, we had hoped to track down Cervo, the gigantic stag sculpture that presides over Vila Nova de Cerveira but he proved so elusive we gave up. We weren’t able to locate any clearly marked walking trails either but you could always park up and have a little wander around the smooth granite boulders. The views from the mountain are worth the drive even if you don’t get out of your car. Many moons ago, the Gods of Olympus crowned a stag a king. Kings, of course, need territories so he and some fellow stags went to live in the uninhabited lands near the River Minho which became known as the Terras de Cerveira (Land of the Stags). Skirmishes and other ills gradually whittled the stag population down until only the king remained. At this point in history, Spain was attempting to reconquer Portugal and a Spanish nobleman challenged the king stag to a duel. The stag won and kept the nobleman’s banner as a trophy. This, along with an image of the stag himself, is incorporated into Vila Nova de Cerveira’s coat of arms. Sadly, the gods had not made the king stag immortal and he died alone in the rocky mountains some time later. He may be gone but he’s definitely not forgotten. Just hard to find. We stayed on the outskirts of town, in a modern INATEL hotel that was clean, comfortable and had all the necessary amenities, including a pool. Parking was easy and we walked to and from the village centre along the ecovia (about 20 minutes each way). Breakfast was disastrous on one of their busiest days but overall, it was a reasonable base for exploring. If you’d rather stay somewhere with more unique charm, don’t worry, there are plenty of options including the cute Casa do Cais Cerveira, a self-catering cottage with granite walls and a small garden overlooking the castle and opposite the place where we had lunch. Casas da Azenha (Mill Houses) are not far from Cerveira and look gorgeous with wooden, ivy-covered cottages right by the river but with the added bonus of a pool. I now realise that it was seeing a photo of these houses that put Vila Nova de Cerveira on my wish list. Convento San Payo now offers bed and breakfast with gorgeous views over the river and town if you don’t want to have to fend for yourself completely. It’s got a pool, too. Alternatively, you could stay in an 18th century manor house with charming traditional features and furnishings as well as modern amenities and a pool. Quinta de São Roque has bikes for hire and can arrange outdoor activities and tours. For a Portuguese village, Vila Nova de Cerveira has a surprising number of quirky bars and cafés. Tasca do Cais quickly became our favourite spot. It has an outdoor space overlooking the river with furniture made from pallets and lanterns dangling from an ancient olive tree, providing a space to relax with a port tonic while listening to birds chattering and mellow music. If it’s too cold to sit outside, head to its cosy yet edgy indoor bar/restaurant across the Largo de São Sebastião square. We were also delighted to stumble across Vale do Cervo, a tiny restaurant in one of the back streets that had shaded tables outside. For 5.50 euros each, we had quiche and salad as part of menu do dia that was great value for money. There are plenty of other restaurants, both in the historical centre and in the more modern residential areas. Both the steak (naco) and bacalhãu dish we had at Abrigo dos Andorinhas were delicious. Pizzeria Vila d’Artes in the main square do nice sandwiches for around 2 euros if you fancy something lighter. 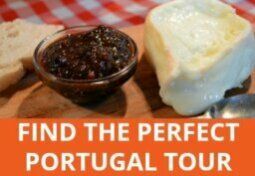 Disclosure: this article about things to see and do in Vila Nova de Cerveira contains a few affiliate links to hotels on Booking.com, my favourite hotel website. If you book using these links, the price you pay is not affected but I mat receive a small referral fee, which is needed to keep this blog going. Looks beautiful! I’d love to be there for the festival. 🙂 We’ve just booked flights for the end of August but Mick is set on being lazy and I doubt I could persuade him to make the journey. This a bit far from your usual stomping ground but well worth it. Looks like a lovely area to get to know. I love those umbrellas! All of the art looks interesting. Thanks, Nanice. The umbrellas and lampshades in the streets were so pretty. It’s certainly got a quirky charm. Interesting as ever, Julie. I’m glad you love my part of Portugal as much as I do. For me the Minho is the loveliest part of Portugal with its pretty market towns and its glorious hills and valleys covered in wild flowers. I always feel that it’s a pity that so few people come north instead of heading for the over-touristy Algarve. I couldn’t agree more, Margaret. I used to be a real beach bum but I’m so much happier with greenery and mountains these days. And of course the Minho has them in spades!